This paper deals with the production of biodiesel from the brown seaweed Sargassum myriocystum, a third-generation biodiesel from the Gulf of Mannar, Rameshwaram, India. The optimization of reaction parameters was done using Design-Expert software version 8.0.7.1. Algal oil was transesterified using methanol and sodium hydroxide. 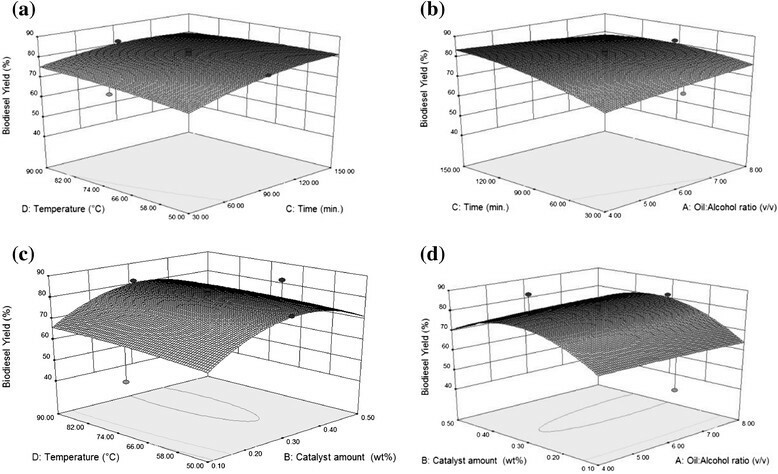 The effect of oil:alcohol ratio, catalyst amount, temperature, and time on biodiesel yield was investigated by response surface methodology using central composite design. It was found that the maximum biodiesel yield was obtained at 60°C for 1:6 (v/v) oil:alcohol ratio, 0.4 (w/w) catalyst amount, and 120 min. The R2, adjusted R2, and predicted R2 values are 0.9977, 0.9956, and 0.9923, respectively, which implies that experimental values are in good agreement with predicted values. 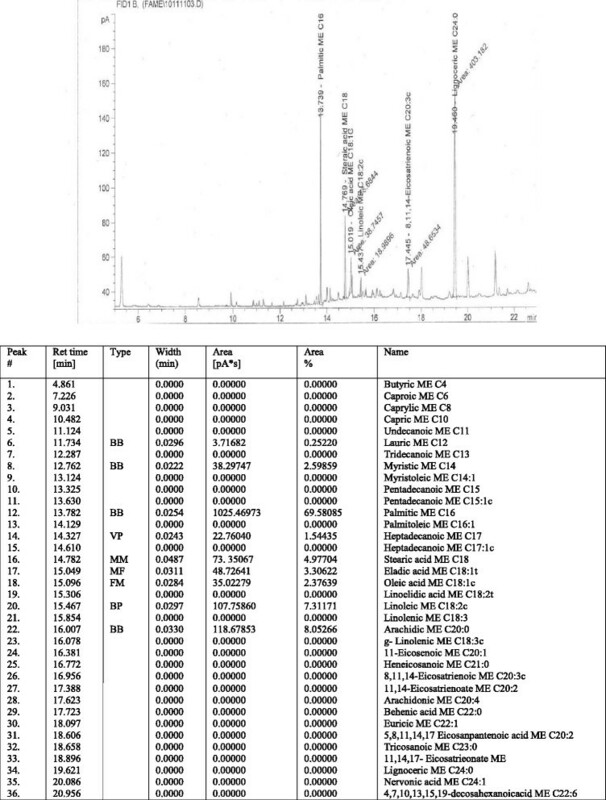 The fatty acid profile of S. myriocystum biodiesel was determined using gas chromatography. Algal biodiesel was stored in dark and light conditions. Fuel properties like kinematic viscosity and acid value were determined. It was found that the samples exposed to light led to an increase in kinematic viscosity and acid value with some sediment formation. The acid value and kinematic viscosity of the samples stored in the dark environment had only marginal increase in fuel properties which were within the range specified by the American Society of Testing Materials (ASTM D6751). India consumes almost five times more diesel fuel than gasoline and burns about 450 million barrels a year of diesel . So in India, search for alternatives is an important criterion to meet current and future energy requirements. India's tropical climate is ideal for the growth of algal species which serves as an advantage over other countries. Approximately 841 species of marine algae are found in both intertidal and deep water regions of the Indian coast . Less than 100 species have been explored for biodiesel extraction. There are two global biorenewable liquid transportation fuels that might replace gasoline and diesel fuel in the future. These are bioethanol and biodiesel . Biodiesel is a processed fuel derived from the esterification and transesterification of free fatty acids and triglycerides, respectively, that occur naturally in renewable biological sources such as plant oils and animal fats . Different countries use the oil which is abundant in that particular country. India, being a peninsula, has a rich source of seaweeds. Algae are classified as microalgae and macroalgae. The potential value of microalgal fuel production is widely recognized -. Macroalgae, which are also known as seaweeds, have comparatively low lipid content. Nevertheless, they are a potential raw material for biofuel production. Biodiesel has good biodegradability, and it is expected to degrade over 98% biologically within 3 weeks while commercial diesel will only degrade 50% biologically within the same period . In Indian waters, species of Sargassum are the most abundant algae . The seaweeds detach themselves from the rocky substrates and are frequently washed ashore. Though details of the phytoprofile , antioxidant activity, free scavenger property , and fatty acid profile of Sargassum have been reported, optimization of biodiesel yield and storage properties have not been reported regarding its suitability as a raw material for biodiesel. Hence, this paper deals with the production of biodiesel from the brown seaweed Sargassum myriocystum as a potential resource for biodiesel. Algal oil extracted from the brown seaweed S. myriocystum was transesterified to biodiesel. Analysis of the biodiesel sample was done using gas chromatography-mass spectrometry (GC-MS). The GC-MS of the biodiesel sample indicated the presence of low amounts of unsaturated fatty acids . Since the fatty acid profile predicted low concentration of unsaturated fatty acids, the biodiesel sample was tested for storage properties. Biodiesel production from algae is hindered by its production cost. This can be overcome by optimizing the reaction parameters to achieve maximum production of biodiesel with minimum cost of raw materials. For this research work, optimization of reaction conditions was done by Design-Expert software version 8.0.7.1 (Stat-Ease Inc., Minneapolis, MN, USA). Central composite design (CCD) was applied to optimize the catalyzed transesterification reaction variables like oil:alcohol ratio, catalyst amount, time, and temperature. Regression analysis and analysis of variance (ANOVA) tested the significance of the model. S. myriocystum is also rich in proteins and sugars. It is being used in food and pharmaceutical industries . By applying the biorefinery concept, all valuable end products can be extracted from S. myriocystum, thus making the cost of algal biodiesel economically viable. This study will enable the seaweed to be considered as a potential option as a biorefinery crude. The brown seaweed S. myriocystum belonging to the class Phaeophyceae was obtained from the Gulf of Mannar, Rameshwaram, India. The seaweed species was chosen because of its availability and lipid profile. It is available all through the year and shows high productivity during the months of July and September. The samples were first washed with seawater and the debris was removed manually. Then they were washed with distilled water, shade dried under the sun, and finally dried in an oven at 60°C. Ten kilograms of wet algae was collected, and after drying, 8.8 kg of dry algae was obtained. Hexane (≥85%), chloroform (≥98%), methanol (≥99%), and sodium hydroxide (≥98%) used for the experiments were of analytical grade. Design-Expert software version 8.0.7.1 was used for the optimization of reaction parameters. CCD of response surface methodology (RSM) was used to optimize the parameters affecting the transesterification so as to achieve maximum yield of biodiesel. RSM can be used to find the relationship among process variables and response in an efficient manner using minimum number of experiments . Several parameters affect transesterification: catalyst concentration, methanol concentration, temperature, reaction time, pressure, and type of oil . The process of transesterification is affected by various factors: free fatty acids, moisture, catalyst type, catalyst concentration, molar ratio of alcohol to oil, type of alcohol, reaction time, reaction temperature, mixing intensity, and organic solvents . The CCD of the RSM was employed to evaluate the effect of reaction time, reaction temperature, catalyst amount, and oil:alcohol ratio on biodiesel yield. The coded values for the variables are shown in Table 1.
where Y is the measured response in percentage yield (biodiesel yield). A, B, C, and D are the coded independent inputs. β0 is the intercept term and β1, β2, β3, and β4 are the coefficients showing the linear effects. β5, β6, β7, β8, β9, and β10 are the cross-product coefficients showing the interaction effects. β11, β12, β13, and β14 are the quadratic coefficients showing the squared effects. A good fuel should have low amounts of unsaturated fatty acids. The fatty acid profile was determined by GC-MS. Since S. myriocystum biodiesel has low amounts of unsaturated fatty acids, the fuel was investigated for its storage properties. Fuel properties like kinematic viscosity and acid value were determined at different time intervals to determine the shelf life of S. myriocystum biodiesel. The samples were stored for a period of 5 months from March to July, which is the average summer period in India. The samples were stored in two different conditions. Two liters of sample was kept in a stoppered amber glass bottle and exposed to sunlight for a period of 5 months, and properties like kinematic viscosity and acid value were determined in an interval of 1 month. Another 2 l of sample was kept in a stoppered amber glass bottle in a dark room for a period of 5 months, and properties like kinematic viscosity and acid value were determined at an interval of 1 month. where A, B, C, D are the coded forms of oil:alcohol ratio, catalyst amount, time, and temperature, respectively. AB, AC, AD, BC, BD, and CD are the interaction terms, and A2, B2, C2, and D2 are the squared terms of the independent variables. The CCD matrix is represented by Table 2. Table 3 shows ANOVA. R2 0.9977; adjusted R2 0.9956; predicted R2 0.9923. The results of ANOVA for the predicted values fit well with the experimental values. The goodness of fit of the model is predicted by the determination coefficient value of 0.9977 and the adjusted R2 values of 0.9956. The predicted value is also in good agreement with adjusted R2 value implying the significance of the model. Only 0.23% of the sample variance could not be satisfactorily explained by the model. Hence, the predictability of the model is at 99% confidence interval. Lack of fit is also not significant, indicating the goodness of fit of the model. The p value serves as a tool to check the significance of each coefficient. The smaller the p value and the larger the F value, the more significant is the parameter reflecting the relative importance of the term attached to that parameter . ANOVA for the response surface quadratic model gave an F value of 465.69, with a p value of <0.0001, implying its significance. Two-dimensional (contour) and three-dimensional (surface) plots indicate the effect of interaction of the different test variables on the predicted response. The three-dimensional graphs and contour graphs are the common graphical representation of the regression equation which shows the optimal values of each dependent variable . 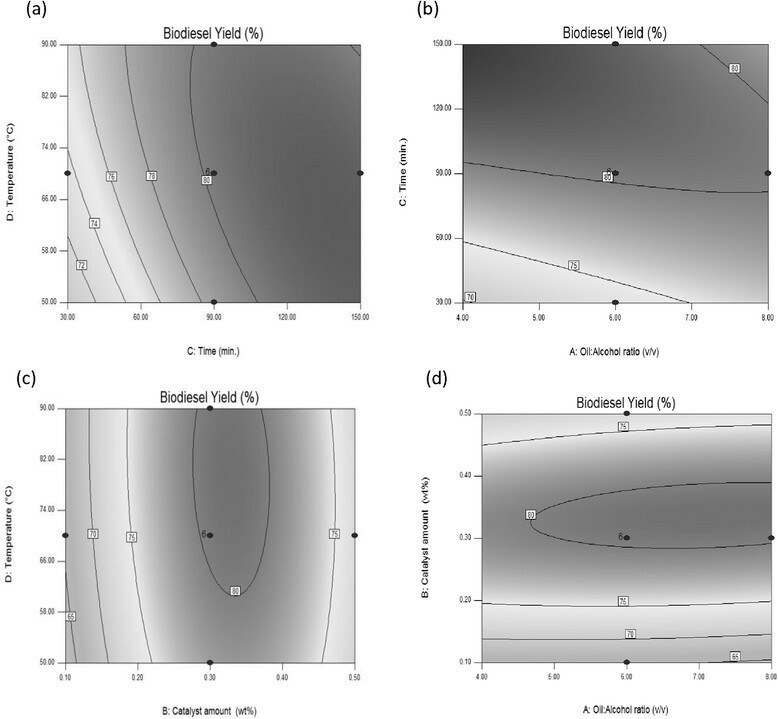 Four surface and contour plots are shown to indicate the effect of interaction of oil:alcohol ratio, catalyst amount, time, and temperature on biodiesel yield. From the shape of contour plots, one could estimate the significance of the mutual interactions between the independent variables in that an elliptical profile of the contour plots indicates a remarkable interaction between the independent variables . Figures 1a and 2a show the interaction between temperature and time on biodiesel yield. They show the interaction between time and temperature at a catalyst amount of 0.4 (w/w) and oil:alcohol ratio of 1:6 (v/v). The midpoint of the plots gives the maximum value of 81.79% which is obtained at 1:6 (v/v) oil:alcohol ratio and 120 min. For low oil:alcohol ratio, the yield value is marginally low at 49.18%. High oil:alcohol ratios are not economically and environmentally viable. Moreover, excessive methanol amounts may reduce the concentration of the catalyst in the reactant mixture and retard the transesterification reaction . Figures 1b and 2b show the interaction between time and oil:alcohol ratio on biodiesel yield. The biodiesel yield progressively increases as temperature increases and shows a decline after 60°C. This could be due to the fact that the solvent tends to evaporate after 60°C since it exceeds its boiling point. Figures 1c and 2c show the interaction between temperature and catalyst amount on biodiesel yield. At low catalyst concentration, the biodiesel yield shows a decline till 0.3 wt% and starts increasing from 0.4 to 0.5 wt%. After 0.4 wt%, the washing of the biodiesel layer developed more foam because of the residual catalyst. Figures 1d and 2d show the interaction between catalyst amount and oil:alcohol ratio on biodiesel yield. The biodiesel yield progressively increases as oil:alcohol ratio increases and starts decreasing after 1:7. At low oil:alcohol ratio, phase separation between biodiesel and glycerol layer was not observed, and as the ratio increased, a good phase separation was achieved. Response surface plots for percentage yield (%) of Sargassum myriocystum biodiesel. (a) Temperature (D) vs time (C). (b) Time (C) vs oil:alcohol ratio (A). (c) Temperature (D) vs catalyst amount (B). (d) Catalyst amount (B) vs. oil:alcohol ratio (A). Contour plots for percentage yield (%) of Sargassum myriocystum biodiesel. (a) Temperature (D) vs time (C). (b) Time (C) vs oil:alcohol ratio (A). (c) Temperature (D) vs catalyst amount (B). (d) Catalyst amount (B) vs oil:alcohol ratio (A). The optimum values of the variables as predicted by the model are 1:6 (v/v) oil:alcohol ratio, 0.4 (w/w) catalyst amount, 120 min, and 60°C. Experiments were carried out to validate the optimum conditions indicated by the model. The experimental result obtained was 79.5% biodiesel yield with a 3.6% error to the value of 83.54% predicted by the model. The experiment was done in triplicate. Since the error was not significant, it can be stated that the optimum conditions are 1:6 (v/v) oil:alcohol ratio, 0.4 (w/w) catalyst amount, 120 min, and 60°C. The composition of the algal biodiesel was analyzed using gas chromatography. Of the sample mixed with 10 ml of methyl heptadecanoate solution, 250 mg was injected into a flame ionization detector at 250°C. The capillary column of length 30 m and internal diameter 0.32 m was coated with polyethylene glycol. The carrier gas was helium with a flow of 1 to 2 ml/min at a pressure of 30 to 100 kPa. Figure 3 shows the composition of S. myriocystum biodiesel. It was found that monounsaturated fatty acids (MUFA) is 5.68 g/100 g, polyunsaturated fatty acids (PUFA) is 7.31 g/100 g, and transfat is 3.31 g/100 g. The sample is composed of saturated and unsaturated fatty acids with 10 to 36 carbon atoms. S. myriocystum biodiesel has 16.3 g/100 g of unsaturated fatty acids and 82.1 g/100 g of saturated fatty acids, indicating it to be a good prospective source for biodiesel . GC-MS of Sargassum myriocystum biodiesel. A major disadvantage of widespread biodiesel commercialization is its low oxidation stability . Conventional biodiesel is a hydrocarbon molecule having no oxygen integrated in its molecular structure, whereas algal biodiesel has fuel-bound oxygen atoms; hence, there is a lot of possibility of oxidation problems when it is exposed to air. The degree of unsaturation of biodiesel makes it susceptible to thermal and oxidative degradation leading to problems of injection in fuel systems . Bouaid et al. studied the storage properties of high oleic sunflower oil, erucic Brassica carinata oil, and used frying oil. It was found that acid value, peroxide value, viscosity, and insoluble impurities decreased whereas iodine value increased with increase in storage time . Das et al. studied the storage characteristics of karanja oil methyl ester over a period of 180 days and found that the addition of antioxidants like tert-butylated hydroxytoluene, tert-butylated hydroxyanisol, and propyl gallate increased the oxidative stability . S. myriocystum biodiesel has a major advantage of having low amounts of unsaturated fatty acids. The unsaturation influences not only the engine performance but also the emission of pollutants into the environment. Emissions of pollutant gases like nitrogen oxides and carbon monoxides will be high if the degree of unsaturation is high. Algal biodiesel has fuel-bound oxygen for combustion to be complete which ensures complete oxidation of pollutant gases. Table 4 shows the storage tests done on biodiesel stored in dark and light conditions for a period of 150 days. The samples were periodically taken out at an interval of 30 days and were checked for both kinematic viscosity and acid value. Kinematic viscosity is an important property of all fuels. High viscosity results in negative impact on fuel injection system performance. The specified range of viscosity of the American Society of Testing Materials (ASTM D6751) is 2.5 to 6. Kinematic viscosity was measured by an Ostwald viscometer. High viscosity leads to decreased atomization, fuel vaporization, and combustion. Samples stored in dark conditions showed only a marginal increase in kinematic viscosity for all samples which did not exceed the specified limits of ASTM D6751 as indicated by Table 4. For samples stored in light conditions, there was a sharp increase in viscosity values which exceeded the standard specifications. The viscosity rises during storage owing to the formation of polymers and to the hydrolytic cleavage of methyl esters into fatty acids . Hence, the properties of the biodiesel samples stored in dark conditions are comparable to conventional diesel properties. Acid number indicates the corrosive nature of the fuel. The acid number for biodiesel should be lower than 0.50 mg KOH/g according to ASTM D6751. Acid value was measured in the laboratory by mixing the sample with ethanol and heating in water bath and titrating it with potassium hydroxide using phenolphthalein as indicator. For samples stored in dark conditions, the acid values did not exceed the prescribed value after a period of 150 days and showed only a small difference from the initial value. The acid value is low for the samples stored in light conditions for a month but the value exceeds the prescribed limit after 150 days, indicating that the fuel had become very corrosive. This is in agreement with earlier studies ,. There was sediment formation in the glass bottles after a period of 90 days, indicating that it cannot be stored and used as a fuel after 4 months. This could be due to the breakdown of molecular bonds and sample degradation. If the quality of biodiesel is not good and contains high degree of unsaturated fatty acids, it would tend to polymerize with the lubricating oil, forming sludge, and increasing engine wear . Storage problems will be more for algal biodiesel than commercial diesel and shelf life is much reduced. The problems encountered in storing biodiesel for a long duration are mainly due to auto-oxidation, photo-oxidation, hydrolytic degradation, and oxidative degradation. This could be due to the fact that light can oxidize the oil. Degradation of the fuel has a profound influence on engine performance. The fuel was tested for calorific value before and after the test for both conditions of exposure to light and in the dark. The calorific value tested according to ASTM D6751 before the test was 41,499 kJ/kg. The calorific value of the sample kept in the dark after a period of 150 days is 38,700 kJ/kg, and that of the sample kept in light after a period of 150 days is 24,520 kJ/kg. The calorific value has drastically reduced because of molecular breakdown owing to degradation. A lower calorific value leads to more fuel consumption for the same amount of work done by a reference fuel. The engine will have high specific fuel consumption for the maintenance of a constant power output in maximum load conditions. Hence, it can be suggested that suitable additives can be added to the fuel to increase its shelf life and storage characteristics. Some additives for biodiesel storage found in literature are pyrimidinols , butylated hydroxytoluene, butylated hydroxyanisol, tert-butyl hydroquinone, propyl gallate, ethylenediaminetetraacetic acid, citric acid, phosphoric acid, and amino acids . The brown seaweed S. myriocystum is a potential resource for biodiesel production. To make the process of making biodiesel cost effective, optimization of parameters was done using Design-Expert software version 8.0.7.1. RSM gave the optimum values of 120 min, 60°C, 1:6 (v/v) oil:alcohol ratio, and 0.4 (w/w) catalyst amount. Maximum yield of biodiesel was achieved at the optimum conditions. The fuel was further investigated for its storage properties. It was found that the fuel deteriorated when exposed to air after a period of 4 months and started forming deposits with high increase in acid value. The fuel which was not exposed to air did not show a drastic change in kinematic viscosity and acid value but maintained a slow and progressive increase in the properties which did not exceed the limits prescribed by ASTM D6751. The calorific value of the fuel had drastically decreased to a lower value on exposure to light after a period of 150 days. It can be suggested that biodiesel prepared from S. myriocystum seaweed is best stored without any contact with air or suitable additives should be added to enhance the storage properties. In India, S. myriocystum seaweed is used in food and pharmaceutical industries. Since this paper substantiates its biofuel property which also meets ASTM D6751, it is an ideal crude for biorefineries. The authors wish to thank the Director of the National Institute of Ocean Technology, India, for the assistance provided. The authors also thank the editor and reviewers for their suggestions, thus improving the quality of the manuscript. AR carried out the extraction, reaction, and optimization studies of the paper. NS performed the storage tests. MP identified the species and helped in the extraction of algal oil. All authors read and approved the final manuscript.